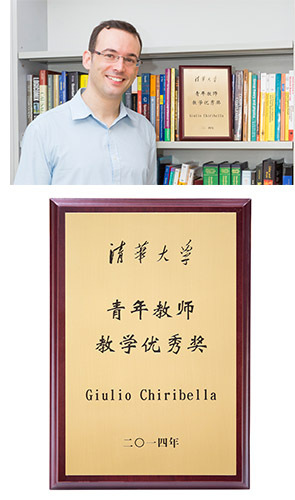 A new member of our Department, Dr. G. Chiribella, who joined us in August as Associate Professor, received a Teaching Excellence Award for Young Teachers from Tsinghua University for his outstanding teaching performance in 2014-15. In fact, he is the first foreign professor obtaining this award at Tsinghua University. The award was given to his undergraduate course on Quantum Information Theory, designed to introduce this fascinating area to students in Computer Science. A new version of the course, adapted to the HKU format, will be offered next semester to HKU students. Dr. Chiribella was awarded the Hermann Weyl Prize in 2010. He was enrolled in 2012 as a member of the Young 1000 Talents Program of China when he was with Tsinghua University. Currently, he is Member of the Standing Committee of the International Colloquia on Group Theoretical Methods in Physics (ICGTMP), Member of the Editorial Board of Journal of Physics A, Visiting Fellow of Perimeter Institute for Theoretical Physics, and Member of the Foundational Questions Institute (FQXi). His research interests are in quantum information and computation, in the development of quantum technologies, and in the foundations of quantum mechanics.